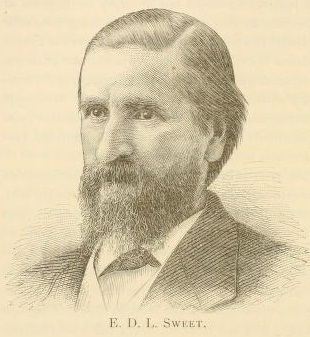 On September 22, 1873, Oakland doctor and stenographer Edwin Smith Belden (1843-1908) told the San Francisco Chronicle that he had received from New York "one of the first five typewriters manufactured in the United States". His claim was picked up by the Washington Republican and quickly repeated by other newspapers across the United States. Belden's skills as an accurate "phonetic reporter" may have propelled his rise to a Californian Supreme Court appointment, but when it came to typewriters, he was way off the mark - and perhaps deliberately so. It seems Belden wanted to give much of the credit for the machine to his friend Charles Washburn and none to the real inventor, Latham Sholes. 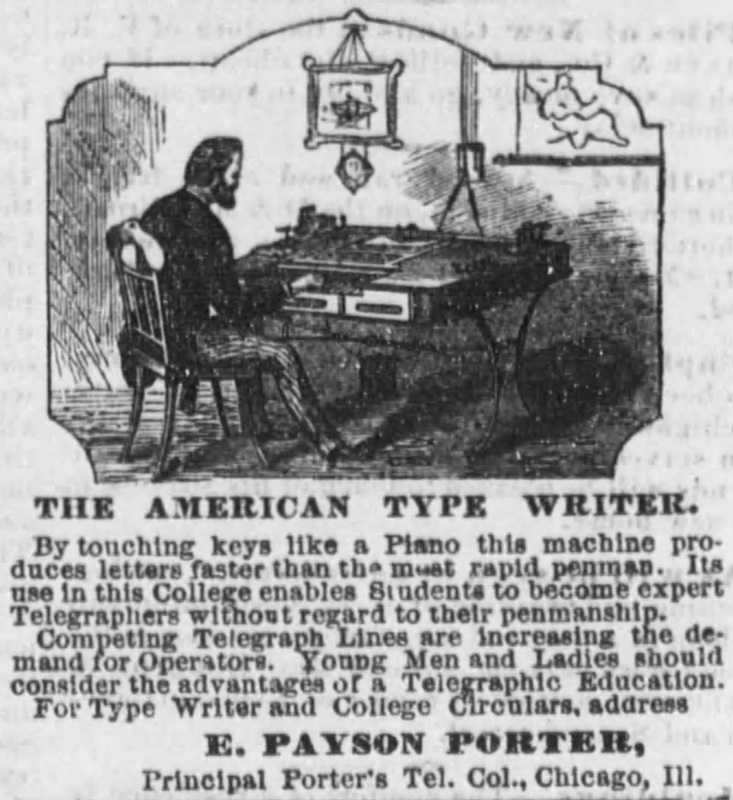 *Chicago telegraphic instructor Edward Payson Porter (1834-1916). *Scottish-born Chicago detective Allan Pinkerton (above, 1819-1894). *Wisconsin lawyer John Rankin Gamble (above, 1848-1891), later a South Dakota Congressman. 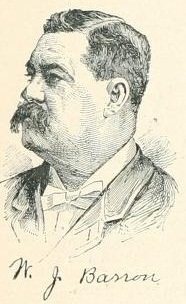 Gamble worked at Fox Lake with fellow typewriter users Julius Holden Dawes (1832-1899), a former major in the US Army, wounded at the battle of Iuka, and his older brother William Fason Dawes (1827-1887). 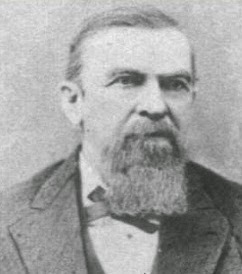 *Daniel Hutchins Craig (above, 1811-1895), a founder and general manager of Associated Press. 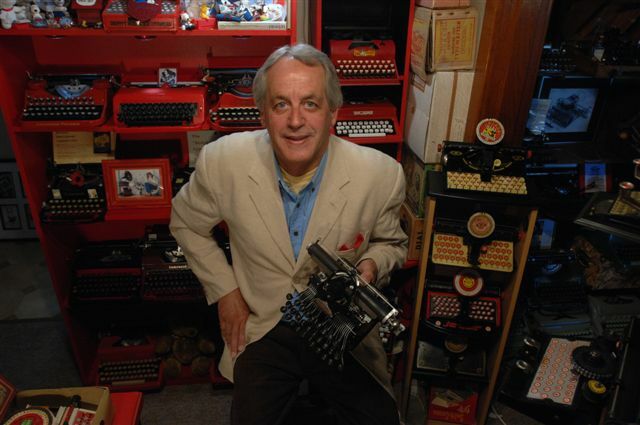 His was one of the first machines to employ the QWERTY keyboard configuration. 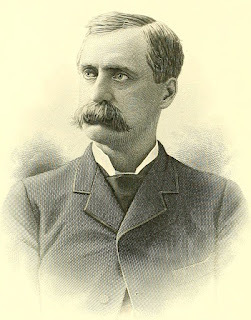 *Washington stenographer James Ogilvie Clephane (above, 1842-1910). *Edward Zachariah Brailey (1842-1903 ), a Civil War veteran and US navy officer who was Clephane's partner. *Clephane's other partner, Walter Jay Barron (above, 1846-1918), stepson of James Densmore. *Edward Daniel Lafayette Sweet (1825-), superintendent of the Atlantic & Pacific Telegraph Company. 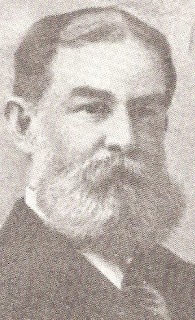 *George Henry Bliss (1838-1897), telegrapher, manufacturer and investor in the Western Electric Manufacturing Company in Chicago. 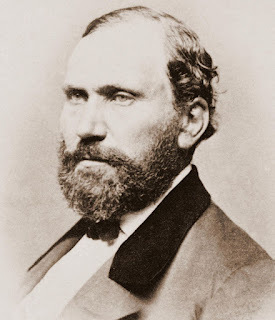 *George Henry Harrington (1815-1892), diplomat and co-founder with Thomas Edison of the Automatic Telegraphic Works Company. 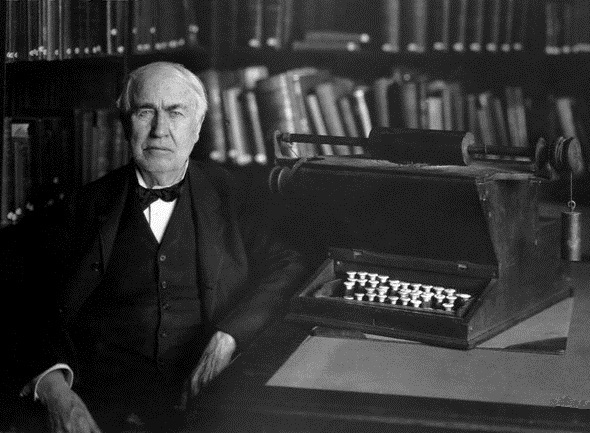 *Thomas Alva Edison (1847-1931), inventor. *Enos Melancthon Barton (below, 1842-1916), an electrical engineer who, with Elisha Gray, co-founded Western Electric Manufacturing Company. Belden was either genuinely confused or being deliberately misleading about his typewriter when he spoke to the SF Chronicle - the latter possibility is more likely. He claimed it was an English invention modified in New York. 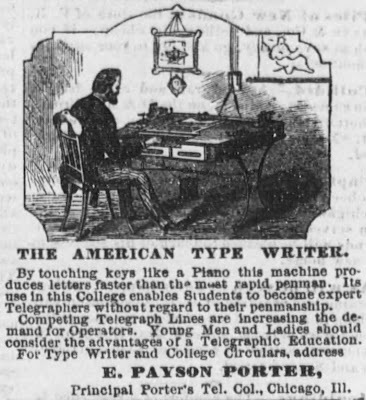 In August 1873, US newspapers had published a London report of a writing machine of American invention! Oddly enough, however, Belden was very clear about the input of Charles Ames Washburn, above, who held a patent on the longitudinal movement of a platen to space letters. The independent incorporation of this feature on the Sholes & Glidden had infringed Washburn's prior patent and Washburn had to be paid a $1 royalty on each Sholes & Glidden sold. And little wonder Belden knew all about this. Belden and Washburn were long-time associates, whose friendship stretched from Hartford, Connecticut, to Oakland, California. As well, the families later became connected through marriage. Belden told the Chronicle the typewriter had been "still further improved" by its combination with Washburn's invention. In all other regards, Belden was describing an early Sholes & Glidden - about the size of an "ordinary sewing machine", with 44 keys (as per Amos Densmore's recommendation) in four banks in a keyboard similar to that of an organ, a spacebar and types at the ends of hammers in a circular typebasket, connected to the keyrods by wires. Belden said a new typing line was attained by a foot-operated treadle, with a bell indicating when a new line was required. Belden did, nonetheless, confess to an important difference with his friend's invention: the Washburn design relied on printer's ink, whereas the Sholes & Glidden used an inked ribbon. In 1885, Belden patented "improvements" to the typewriter in an effort to achieve proportional spacing. So what's a "phonectic reporter"? For that matter, what's a "phonetic" reporter? (Though I guess "phonectic" could be a typo, considering the article refers twice to a "writting" machine.) In any event, some more impressive research here!